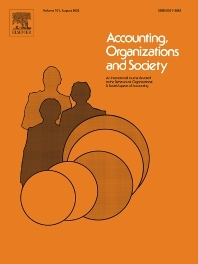 Accounting, Organizations & Society is a leading international interdisciplinary journal concerned with the relationships among accounting and human behaviour, organizational and institutional structures and processes, and the wider socio-political environment of the enterprise. It aims to challenge and extend our understanding of the roles of accounting and related emergent and calculative practices in the construction of economic and societal actors, and their modes of economic organizing, including ways in which such practices influence and are influenced by the development of market and other infrastructures. We aim to publish high quality work which draws upon diverse methodologies and theoretical developments from across the social sciences, and which illuminates the development, processes and effects of accounting within its organizational, political, historical and social contexts. AOS particularly wishes to attract innovative work which analyses accounting phenomena to advance theory development in, for example, the psychological, social psychological, organizational, sociological and human sciences. • Historical studies of the emergence, transformation and impact of accounting calculations, practices, and representations, including the development and the changing roles of accounting theories, techniques, individual and teams of practitioners and their firms, professional associations, and regulators.